Some of my best conversations are with myself. Sure, "we" have our differences at times, but they always resolve themselves after more thought and discussion. When I talk with myself, I am my own cheerleader, and sometimes (rarely) I am my own worst critic. But for the most part, I practice positive self-talk. Practicing self-talk does not mean you are losing your mind. We all talk to ourselves, if not verbally, in our own heads. There are two types of thinking: positive and negative. These are our only two choices. And the beauty (and simplicity) of this is that we get to choose. No one else does our thinking for us; if they do, then we are nothing more than their puppets or slaves. 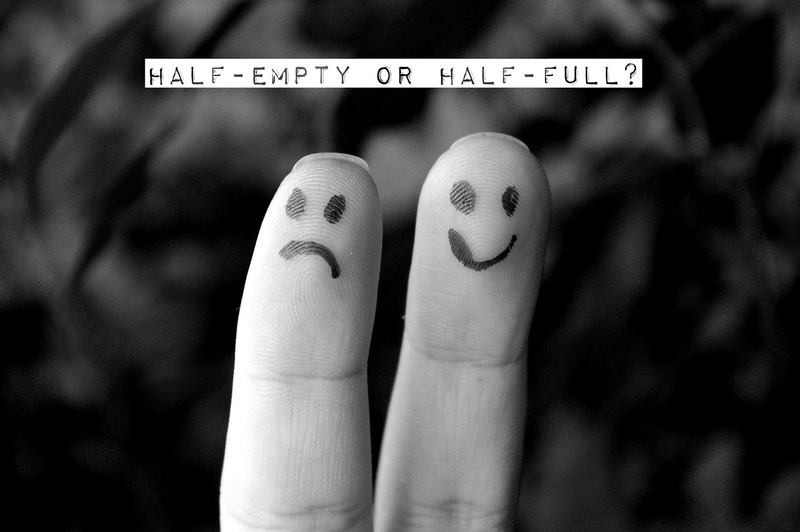 If you're a glass-is-half-full kind of person, you know that positive thinking (self-talk) reduces stress and allows you to live a much happier, fulfilling, healthier life. But if you subscribe to the half-empty style of thinking, don't despair; you can learn positive thinking skills. We generate between 12,000 - 60,000 thoughts per day (depending on the depth of our thinking), according the National Science Foundation, and about 80% are negative. Whoa! That's A LOT of thoughts. And if a high percentage of those thoughts is considered negative, how sad! That's like having a full-time bully in your head. But fear not. Here's how to take control. 1. Practice awareness. Become aware of your type of thinking. Root yourself in the moment and examine the kinds of thoughts you are having. Once you have awareness, you have control. 2. Identify areas in your life that need a positive change. Examine those areas about which you tend to think negatively. Start with one small area and approach it with a more positive mindset. 3. Visualize yourself as a magnet or a radio station attracting a signal. We are what we think. The more energy you give to a thought, whether positive or negative, the more likely it will materialize in your life, just as you've imagined it. Become conscious of the kinds of things you are attracting into your life. 4. Do mental check-ins. Periodically during the day, evaluate the kinds of thoughts you are thinking. For each negative thought, replace it with a positive one. Strive to put a positive spin on each one. Be your own personal cheerleader. 5. Surround yourself with positive-minded people. Being in the company of positive and supportive people encourages us to become more optimistic. These are the people whom you can trust for advice and feedback. They alleviate our stress; whereas, negative people may increase our stress levels, making us doubt our ability to handle stress in healthy ways. 6. Lead a healthy lifestyle. A change in diet while adding exercise to your daily routine affects mood and greatly reduces stress. This helps to fuel your mind and body in healthy ways to reduce stress. When we feel healthier, we feel better about ourselves and our lives. 7. Seek humor in everything. Give yourself permission to laugh, even during difficult or challenging times. Humor helps us to maintain our sanity. Practicing these tools will help you to find and maintain balance and peace of mind. The bully in our brain will back down each time you throw punches of positivity. You'll be surprised at how much control you really have. How are your inner conversations? What other tips can you share? Another GREAT post! I totally agree with all of this. Being positive, like anything else, can become a habit so the more you do it, the easier and more natural it will be. Kathy, it's a wonderful habit to have, isn't it? The positive vibration of positive thinking allows so many wonderful things to flow into our lives. Thanks so much for stopping by and commenting! I always appreciate your thoughts and support. You are welcome. I always enjoy your great posts! Thanks, Barbara! My aim is to inspire so that we can lead authentic lives. You are very welcome, Diane :) Thanks for stopping by. Great post with great tips :) Keep up the good work! Dear Penny, this is a wonderful post! I am a believer of 'you are want you think' and I could connect with what you were saying....thank you! Wonderful! I will read it and comment. I know of this bully in our brain.. It creeps up the most negative of thots and catches us unguarded! It sure does, Mina! That's why it's important that we take the time to check in with ourselves periodically. We need to keep the upper hand! Thanks for stopping by. This is a wonderful post. I do practice positive thinking and have found it easier to quash those negative thoughts faster than I was able to in the past. Number 7 is my favorite. What a wonderful gift humor is. Blessings, Pen. Hi Andrea! Yes, it does get easier the more we practice these tools. It may take a little time, but once we master the skill, our lives change for the better. Blessings to you, too, Andrea. Ailsa, just remember that a test does not define who you are. You are much MORE than a test. Learn from it and then move on. The stress is not worth it. Sometimes it takes some work to overcome the negativity, but when you keep at it, things do get better. I'm glad these tips helped you.